It was now time to visit another couple of Tim's friends. This time Shaggy (or Shagrin – actually her name is something quite different, but all these internet people seem to have a nom du guerre under which they are known in the community like Based Mama who we visited in Gilbert, Az), living with her husband, Jay, and two children in Bonham in northeastern Texas, not far south of the Oklahoma state line. She had promised she was able show us some of the strange animals, called Texas Longhorn - ie cows. We have previously been looking for these animals, but without ever seeing one, and that's why I had come to the conclusion that they actually existed only in legends. So I was looking forward to finally be able to reject that theory and make sure, that they were more than mythical creatures. Tim had exchanged messages with Shaggy a few days earlier, and she had initially misunderstood when we would arrive in Bonham, and she thought it was not until Tuesday, but it was actually already on Monday. She would therefore be at work until around 1 pm so we tried to adjust our arrival according to that. She also regretted that we could not get the Texas Barbecue that she had promised Tim before we left home as there would not be enough time to prepare that, but promised that instead we would get some really good, slow-cooked Tex-Mex food, prepared by her neighbor and partner in crime – or at least partner in making videos for YouTube. But first we had to get to Bonham. This meant a drive on I-20 to Fort Worth and circumventing Dallas north of the city using local roads. Unfortunately, it didn’t turn out that way. The first part of the journey on I-20 to Fort Worth went just fine, but then it started to go haywire. 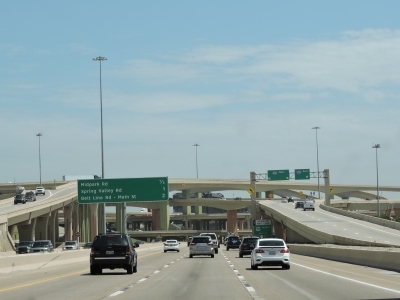 When we approached Dallas we ran into a series of roadworks, and every time our GPS wanted us to exit the freeway either right or left, there was road work at those places and the exits were closed. Instead, we ended up on I-30, which led us through most of central Dallas before we were finally through the road work and the GPS could lead us north again. On this stretch, I was doing the driving, so Tim managed to take some really good photos of skyscrapers and other buildings in Texas's largest city. In fact, Dallas-Fort Worth is the fourth largest urban area in the United States, only surpassed by New York, Los Angeles and Chicago. More than 7 million inhabitants live in the area, and the road was packed with cars; In addition, some of the intersections were quite complex, so it was about watching our steps (if you can do that when you are driving a car – in Danish we would have said “keep the tongue straight in the mouth”, but I don’t think that will make any sense in English). But we had to keep our eyes and ears on the gps - well, the eyes were probably a little bit on the road as well. The traffic volume also meant some very slow driving, but eventually it was possible to get out of town in the right direction. When we reached Bonham after about 4½ hours of driving, we found the street on which Shaggy lived easily enough (though with a little help from the gps), and after some driving around among the buildings in the area, we also found the correct house which turned out to be a relatively small townhouse. After having said hello to her and her two children, we headed out to see the cows! 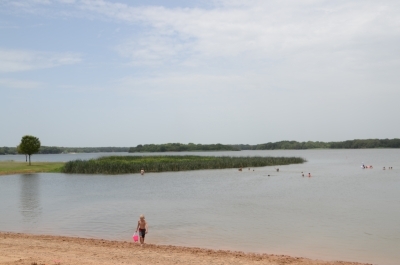 At the same time, she would show us Lake Bonham, a rather large lake north of town where there were swimming possibilities for the children. As it turned out the promised cows were somewhere along the way to the lake, and when we reached this place there actually were a bunch of cows in a field, and they did have horns, and they resembled the pictures I had seen of Texan longhorn cattle, but I'm stilll in doubt whether Shaggy had just disguised some ordinary cows to keep her promise :-). We only looked at the cows for a short time, because they decided to leave us and go to the far end of the field where they were hidden behind trees and bushes. Definitely not tourist-friendly cows, but we did manage to get a few pictures. After looking at the cows, we continued to the lake, where Shaggy's two children, a girl and a boy enjoyed taking a dip while we chatted on the beach in the meantime. I have unfortunately forgotten the names of the two children (but the girl was called Clone, because she looked so much like her mother and the boy was called Squeaker). Unlike the last couple of days, the temperature was again above 105 °, so after a couple of hours of talking and bathing we headed back to Bonham. When we reached the town we passed a small stand where you could get something that looked like the snow cones, we knew from home, a cup of crushed ice poured with different fruit juices. Here Shaggy had apparently promised her children a trreat, so when she turned in here, we just followed. At one of the tables outside the booth was a lady with two little boys, and it turned out to be Shaggy's sister-in-law and her nephews. That is Shaggy's nephews, not the sister-in law's nephews. Then we had a chat with her while the four children - and Tim – enjoyed their snow cones. After that Tim and I continued to our hotel where we had not yet been checked in since it was too early to get a room when we got to town, so now we would just get our room and relax for a while and then we should return to Shaggy’s place and have dinner. When we had checked in, we had to get the luggage up to the room and it was we got into the elevator, the drama, which I promised in the header of this article, began. On the way up in the elevator, Tim suddenly said, "I'm not feeling too good. I think I'm going to faint", and so he did, fainted that is. Just as the elevator reached our floor he fell forward and banged his head into the elevator door just as it was opened. Tim's head survived, but it turned out later that the elevator door did not. It had suffered so much damage that the door could not be closed, and it was actually not repaired until the next day. But in the first place, Tim was halfway in and out of the elevator in his unconscious state. Fortunately, I could see that he both breathed and had a pulse and, in fact, he was not more pale than usual. I tried to drag him out of the elevator, but Tim is a big boy, so I simply couldn’t, so instead I poured cold water on his head and that made him wake up. He even got himself pulled out of the elevator and sat on the floor outside leaning on the wall while I carried our luggage to the room. When I returned to Tim, he was still a little groggy, so he got more water, both on his head and in the stomach, and then he got so much better that he could get up and walk to the room. Here he lay down on the bed and relaxed with another bottle of water next to him while I went down to the front desk to report the situation and the broken door. The young lady and the manager on duty were both very helpful and gave us more water when I said that there would probably be no need for a doctor or ambulance. Back in the room, we agreed to wait and see if he would get better before we canceled the dinner at Shaggy’s place. When Tim had rested for another hour or so, he felt much better; actually he felt so good that he could laugh at the fact that he can now write on his resume that he can destroy an elevator door with his massive head. At that point he discovered that his glasses were missing and we could not find them anywhere in the room. I walked out in the hallway to the elevator, but they were nowhere to be seen neither in the elevator that still remained on our floor nor in the hallway outside. I therefore went down to the front desk to ask if someone had found them, but that was not the case. That was what I could tell Tim, and we agreed that he might have dropped them when he fell over and that they might have fallen down in the narrow space between the elevator door and the hallway outside. After another hour of full speed on the air conditioner and more water, he had recovered so much that we agreed that we could visit Shaggy. We talked about what had caused the fainting, and agreed that it was probably not dehydration as even if it was hot, he had drunk abundantly, and at least no less than me. In the end, we came to the conclusion that it was probably due to the cold shock his stomach had had from the ice that he had eaten - a very large and very cold portion of ice in a warm stomach. Closer than that we didn’t get, but nothing further happened for the rest of our trip. When it was time to leave the hotel he felt just as well as he usually do, as in back to 'normal' – if you can say that there is anything normal about Tim :-). When we got down to the front desk we told our theory about the glasses, and the young lady promised that she would send someone down to look at the bottom of the elevator shaft. That said I have to add that Tim fortunately had brought a pair of spare glasses and therefore could continue the trip without any problems. We therefore just returned to Shaggy, with me doing the driving though – just in case. We didn’t stay in Shaggy's home, but walked the few yards to her friend’s house. She had more room and it was she, who had slow-cooked the Tex-Mex food we were having for dinner. The friend, Addi (or Adelaide Chaos, fortunately just another internet nom de guerre) and her husband had two children called Mayhem and Mischief (not their real names I sincerely hope), the youngest of which was only a few months, while the oldest was about three years old, and very entertaining :-). The food was excellent and Tim announced that it was the first time he had eaten beans that he actually liked, and he must have meant it because he still talks about it when we talk about the trip. Shaggy's two children were, of course, present as well and later her husband arrived when he got off from work. It was an incredibly pleasant evening with very pleasant company, at least in my opinion, and I think that thought so so too, because they have invited us back when we get to their part of the world next time - which we have planned to do already on next year's trip. Around 10 pm we unfortunately had to say goodbye as we had to drive a relatively long trip south to southern Louisiana the next day, but before we left, we were given some excellent but strong homemade BBQ sauces that we had already tasted on some tortilla chips. I have already eaten the sauce that I got; I don't know if Tim has used all of his. I thanked Shaggy many times for showing me the longhorns, even though the horns were not as long as I wanted, but they may be next time - or I'll see some other cows. When we goy back to the hotel, we asked for the glasses, but they had not been at the bottom of the elevator shaft so what happened to them remains a mystery. Perhaps they are on a "shelf" somewhere in the shaft. The trip from Abilene and the excursions we had made in and out of Bonham added up to total trip of 283 miles - ie a medium long trip. Normally, when we get on the smaller roads we don't see that many of the trucks we are counting for our game, but for some reason, my favorite company, JB Hunt, the one company that started it all and whohad dropped somewhat behind in this year's competition, were abundant on the roads around Bonham.